Christopher Jones a construction firm owner and self labelled "life time" Fianna Fáil supporter and Christopher Jones Jnr. The Flood/Mahon tribunal into corruption in the planning process in the 26 Counties is trudging into its ninth year of sittings and has for the most part disappeared from public view, but the current module of investigation dealing with the relatively small issue of the rezoning of lands in Ballycullen, South Dublin has thrown up an incredulous story of conflicting testimonies by serving Fianna Fáil and Progressive Democrat ministers, and the leader of the Labour party Pat Rabbitte. The Tribunal sittings have uncovered forgotten meetings and donations running to thousands of euros as well as conflicting testimonies from Séamus Brennan, Tom Kitt, PD leader Mary Harney, Labour's Pat Rabbitte and former Fianna Fáil Government Press secretary and political lobbyist Frank Dunlop, whose six figure slush funds oiled the Dublin county council planning processes in the late 1980s and early 1990s. At the centre of the investigation is a planning application by Christopher Jones a construction firm owner and self labelled "life time" Fianna Fáil supporter who wanted to have his 77 acre farm in Ballycullen rezoned for building development. Jones donated €57,138, what was then £45,000 to 20 different politicians through Frank Dunlop whom he had hired to lobby on his behalf. In November 1992 the Ballycullen land was rezoned. Currently Government Chief Whip, Tom Kitt was up until early 1992 a member of Dublin County council and Fianna Fáil TD for South Dublin. It has emerged in recent weeks that Kitt had forgotten to tell the Mahon Tribunal of political donations running to €3,809. Kitt did tell the Tribunal he had received a €634 donation from Christopher Jones in 1991 and €1,015 from a Frank Brooks, an employee of Christopher Jones at a Fianna Fáil fund raising Golf Classic last year. The Mahon Tribunal had uncovered three other payments running to over €3,800 and paid to Tom Kitt in 1992. The "pressures of work" had led Kitt to make a response to the Tribunal that was 'less comprehensive than it should have been'. Kitt was "annoyed" that he had forgotten the donation. Kitt had also failed to tell a Fianna Fáil inquiry of the extra payments. His reason for this was the inquiry had only dealt with his time as a member of Dublin County Council and he had given up his council seat upon becoming a minister in 1992. So he didn't tell the inquiry team about any donations after March 1992. Kitt did recall being lobbied by Christopher Jones and another of his employees Oliver Brooks, but he was not a member of the council when in November 1992 the motion came before Dublin County council to rezone the Ballycullen lands, and Kitt stated that he did not ask anyone on the council to do anything on the vote. Kitt contradicted evidence, given by Mary Harney to the Tribunal, that she had discussed her concerns about corruption on the council with him in the 1980s. He had he said no recollection of these discussions. Séamus Brennan was a minister from 1987 and gave up his council seat as was the precedent set by Fianna Fáil in government. In the two years before that he had told the Fianna Fáil inquiry team that he had attended very few council meetings between 1985 and 1987 and had "no involvement with significant rezoning proposals". Brennan's reason for non attendance had been because he was in dispute with then Fianna Fáil leader Charles Haughey. However in the 1990s Christopher Jones gave Brennan £4,700. Brennan told the Tribunal that he had no direct contact with Jones and had never received any political donations directly from him. He had no more knowledge about Ballycullen than 'the man in the street'. Brennan was merely a "postman" for Fianna Fáil, as he was National Organiser for Fianna Fáil at the time and a 1994 £3,000 contribution was given to help reduce Fianna Fáil's overdraft. Jones wrote to Brennan after the fund raising dinner where he handed over two £1,500 cheques and thanked him for an "enjoyable and instructive" evening. Jones' diary records a meeting on 23 January 1991 "Séamus B and Tom Kitt". 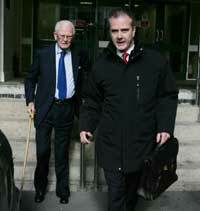 Brennan told the Tribunal that he couldn't have met Jones on this day as he was at eight or nine meetings. Jones also said that he had sat beside Brennan at a 1994 fund raising dinner where he had given Brennan £3,000. Suspicions of corruption in local government were first raised by Mary Harney in the 1980s. She told the Tribunal in February that "There appeared to be some people who had a lifestyle that might not have been compatible with their obvious income". This though did not stop her entering government with Charlie Haughey in 1989 when his lifestyle might have fitted the above criteria. According to Harney she raised this with her then fellow Fianna Fáil councillors Tom Kitt and Chris Flood. Kitt has told the Tribunal that he cannot recall such a conversation. Harney received a €1,270 donation from Christopher Jones in 2002, She had lodged it in the Progressive Democrat election campaign account. Harney also disclosed to the Tribunal that she had met Mr Jones and the chief financial officer of his company in 1991 and 1992 when he was seeking to have the lands rezoned. She had no recollection of the content of the meetings. Harney did not seek re-election in the June 1991 local elections and had encouraged the seven councillors who did get elected to "do their own thing" on planning matters and not apply a party whip. Labour leader Pat Rabbitte was a councillor and TD with a new political party to support and an election only weeks away, when Frank Dunlop arrived at his door in November 1992. Rabbitte told the Tribunal that Dunlop gave him €2540 on behalf of a small number of Dunlop's clients. Rabbitte maintains that there was no discussion about planning and no mention of the Ballycullen lands. He told Dunlop that it was up to the Democratic Left constituency council to decide whether to accept the donation. A month later he returned the donation. Frank Dunlop told the Tribunal that he gave €3,810 to Rabbitte in cash, whom he alleges only returned €2,540. Dunlop told the Tribunal he would not have made the donation if Rabbitte had not supported the Ballycullen rezoning two weeks before he called to his house. Dunlop described Rabbitte as his "pal" and claims that he did mention the Ballycullen rezoning and Christopher Jones when handing over the money. Dunlop also said that there had been a call from Rabbitte to his office the previous day. Some years later Dunlop and Rabbitte met just before Christmas in Brown Thomas, the exclusive Dublin department store. Dunlop alleges that Rabbitte told him he had been contacted by the Tribunal that Rabbitte "presumed that matter between us would never arise". Rabbitte disputes this and said it was a "pretty frivolous encounter". So there we have it, two ministers with amnesia and two party leaders with testimonies disputed by other evidence to the Tribunal. It is hard to know who to believe, especially when it seems easier for current government ministers to forget the difficult details. The Mahon Tribunal continues.